Pictures on the site would be classified in alphabetical sub-classifications according to the names of the saints, and pictures will be added to the new dates for the celebration of the martyr, if it’s God will we lived. هل من الممكن أن تتصل بي على الإي ميل، أريد أن أسأل عن أمراً ما..
متشكر جدا يا اخ سامى على ذوقك وإهتمامك ، من يده وأعطيناه .. I highly enjoyed reading this article, keep up making such interesting articles! This is an amazing job and your drawings are very accurate. I have been using your pictures for Sunday School for a few months now, and i must say, they are a blessing and a true treasure. Thank you for your efforts and God Bless you. النعمة معك .. وربنا يبارك فيك وفي خدمتك الجميلة ..
ربنا يبارك خدمتك يا اخ مينا أنت ومن معك وأتمنى أن ترسل لى لينكه عند أفتتاحه لأستفيد منه وأفرح بعمل الرب معكم. Wow, this is a great work.. God bless you..
And thanks for your open permission to publish these images worldwide.. Along with a link back to this page, so others keep benefiting from your great service..
– I think you should concentrate more on Coptic images, more than Bible images, as your work here is mainly unique on the web..
– It’s good that you explained the software you use.. but it would be great if you give more info.. like: how long approx. does an image an image take.. and what would be great is if you publish a video or a couple of videos showing the steps you use to trace the images.. so others could share and enrich the Coptic content online..
http://st-takla.org/ is the Dean of the Coptic Orthodox religious sites, and I am very happy to see the transfer of encyclopedia images . how can my kids read the saint stories in English and we need to print the pictures for Sunday School can we. 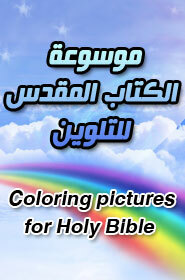 Hello CopticSaints, can you please send me your e-mail address, I would like to speak with you. My email is ……… Thank you.